This entry was posted on Monday, October 22nd, 2018 at 10:51 am	and is filed under Photos. You can follow any responses to this entry through the RSS 2.0 feed. Both comments and pings are currently closed. Do not picnic under this tree. Yeah, the sidewalk underneath it was pretty well Jackson-Pollacked! I like that. Are those Starlings? Not sure what they were – not doves, not grackles, maybe sparrows? – but there were a lot of them, all clustering in the bare tree. 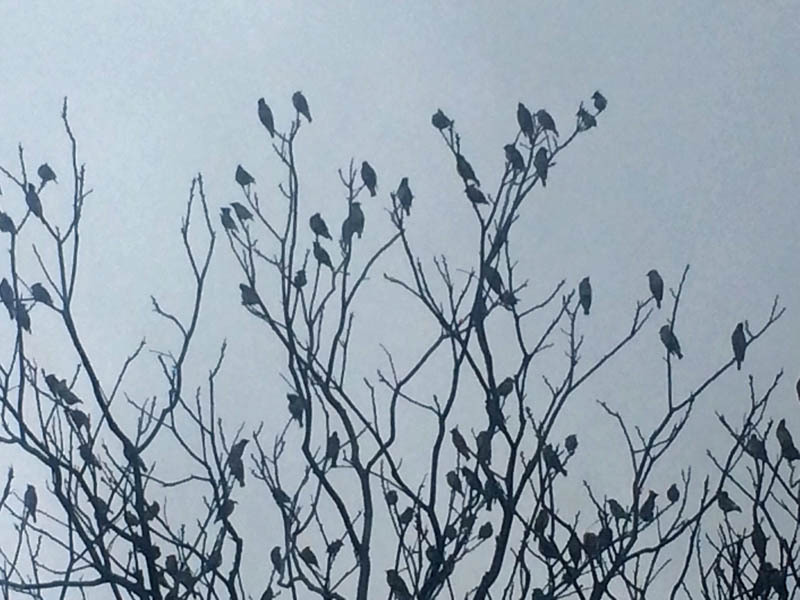 From the silhouettes, they look like they might be cedar waxwings. Waxwings are very sociable birds and typically stay together in large flocks as they migrate, so that fits in with the image as well. Waxwings love to eat all kinds of berries. At our old house–in Austin, not that far from you, Sgt. Mom–we had a lot of giant ligustrum trees around and when the waxwings arrived, they’d pick them clean of berries within a couple of days (if not within hours). And, yes, the deck and driveway looked very Jackson Pollacked. You are probably right about them being a flock of cedar waxwings – the tree wasn’t a regular roost, they were too small to be doves – and spring would have been the right time for a flock to be migrating. It was an amazing sight, the branches all filled with birds, and the mono-color effect against the foggy sky. They all took off about a minute after I took pictures.